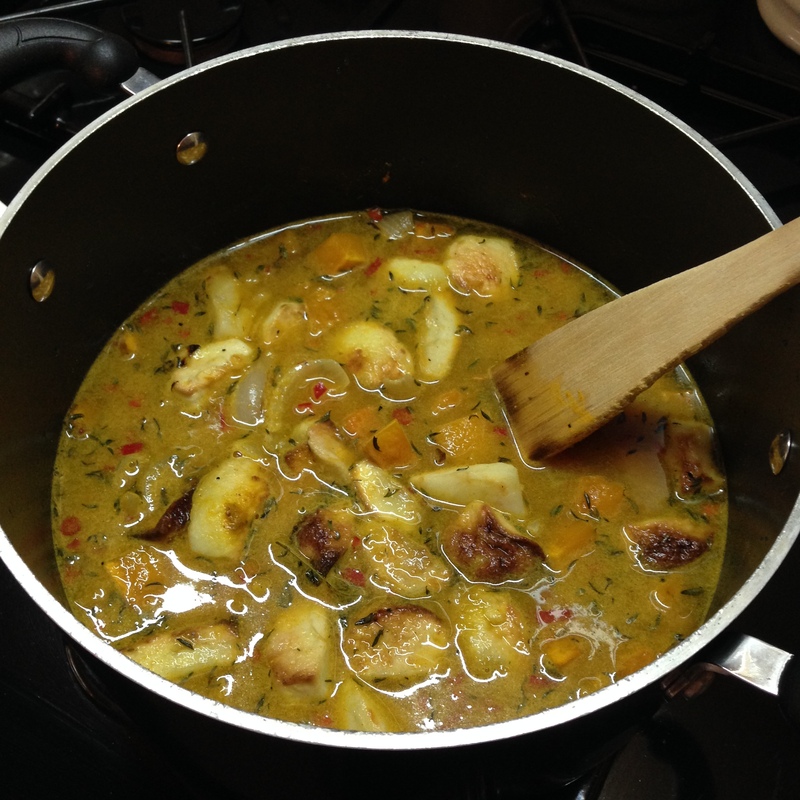 Curried Squash and Apple Soup. This summer we discovered some new varieties and methods of preparing all the squash we got our hands on. We cooked with Zucchini flowers, Patty Pan, Globe Squash stared in our Summer Ratatouille, and Zucchini Carbonara.We also roasted Delicata with pumpkin seeds and cranberries in early October. The Abundance of Winter Squash is a blessing as we turn to making hearty soups to warm the soul during the cooler weather. One of our favorites is Curried Butternut Squash and Apple. How do you beat the creaminess of the squash combined with the sweet/tart flavor of crisp apples? You just know these two ingredients will work well since they both come to harvest together. 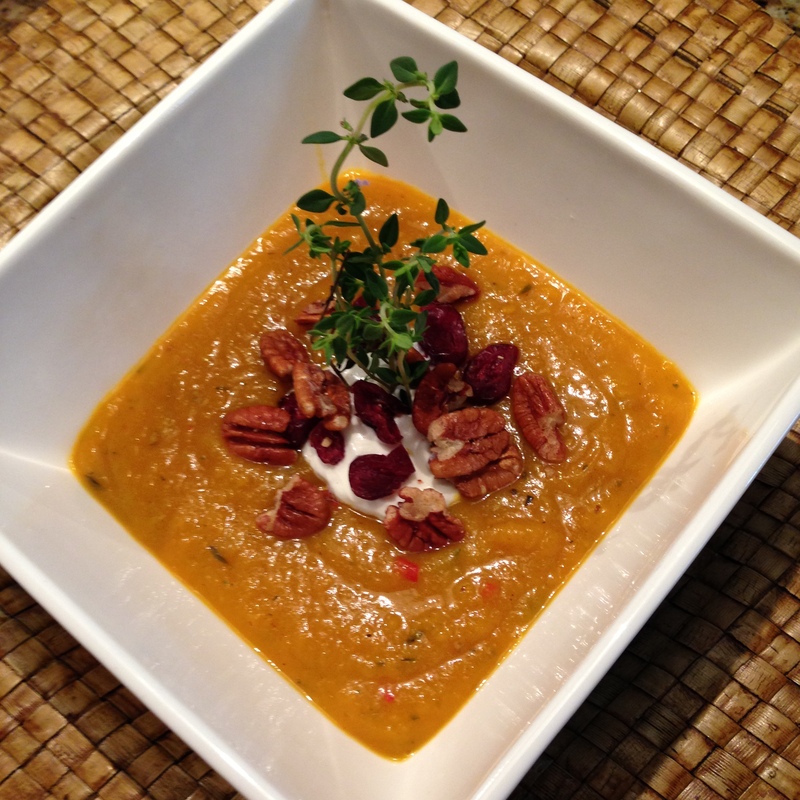 Curried Butternut Squash and Apple soup was one of the first soups that our son Justin perfected. He makes a mean Roasted Red Pepper Soup as well. If you don’t like curry you can still make the soup but perhaps you’ll use a bit of cinnamon and allspice instead. We feel the soup really benefits from the zing of spice, so be creative and try it your way. TwoFoodNuts Roasted Butternut Squash and Apple Soup. Peel and cut up the Apples, Squash and onion. 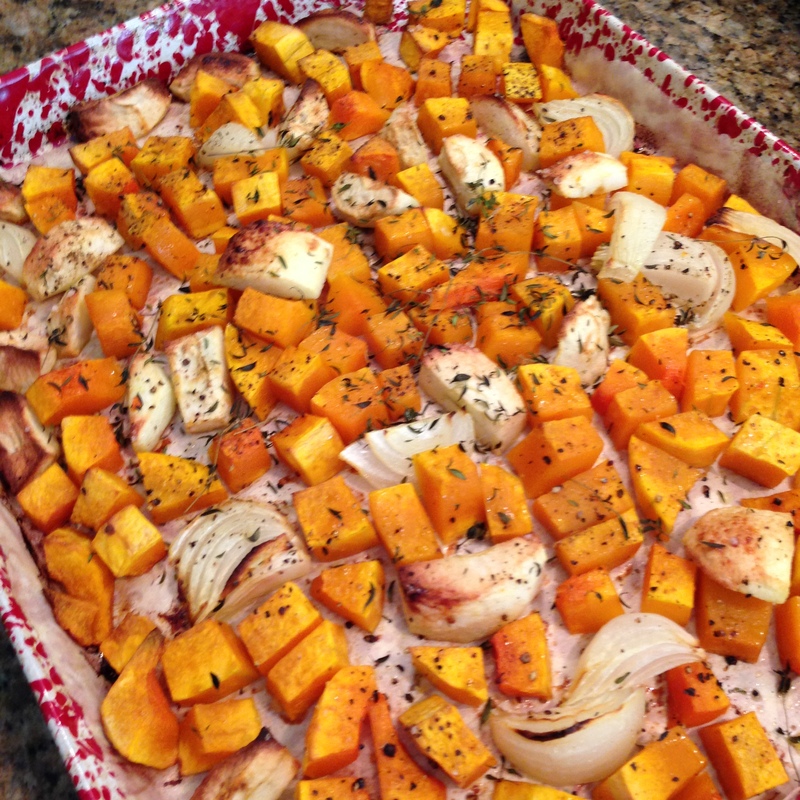 Spread on a baking sheet lined with Parchment Paper. drizzle with oil, add salt and pepper to taste. 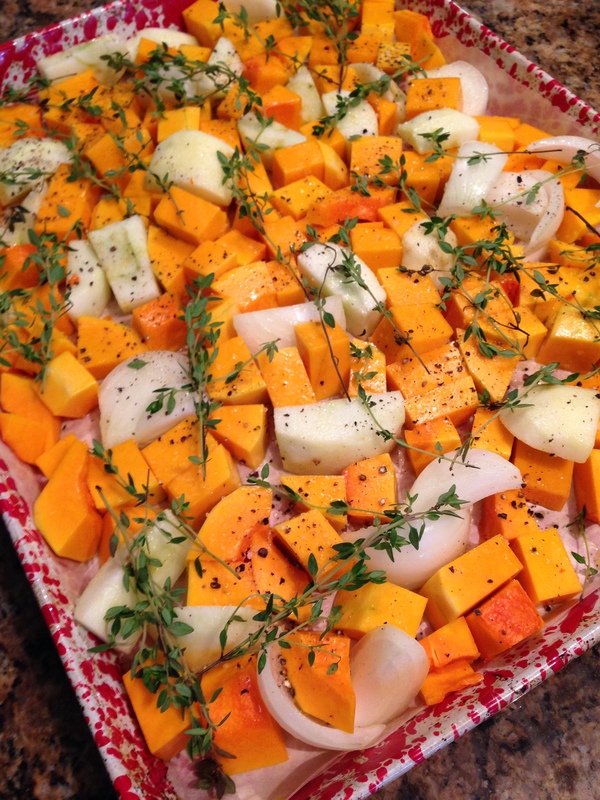 Place Thyme sprigs over the top and bake at 400F for 45 minutes to an hour. The Squash should be fork tender and slightly caramelized. 1 Knorr stock package (Use Chicken or Vegetable stock depending on if you are going vegetarian). Add the roasted vegetables to the soup base and simmer for 30 min. 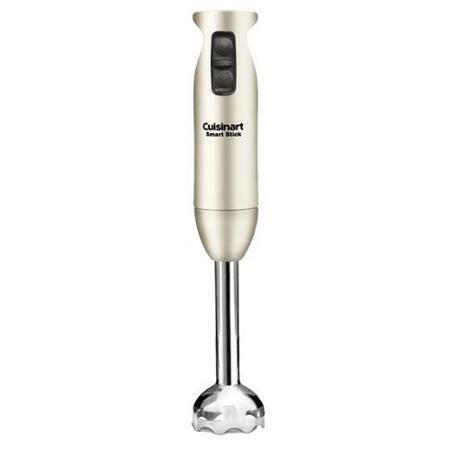 Remove the Bay leaves and puree with a stick blender or place in a regular blender. Garnish with a dollop of sour cream and a sprinkle of cranberries, pecans and a fresh Thyme sprig! Indulge! We hope you love this hearty and a bit spicy soup. Please remember to share the recipe with your friends and family. Leave us a comment if you have a moment.